Since the UEDA and IEDC conference in early October, I’ve enjoyed many conversations about the role of entrepreneurship in economic development. It was an epiphany when I connected the Ansoff Matrix tool used in marketing to observations of the efforts by other states to shift some of their entrepreneurship focus to stimulating more innovation and entrepreneurial thinking in existing business. They were making this shift in order to reduce the risk of failure and speed up achieving economic development results. The conclusion I reached, that seems simple and obvious now, is that entrepreneurship is only the most extreme and riskiest form of innovation. 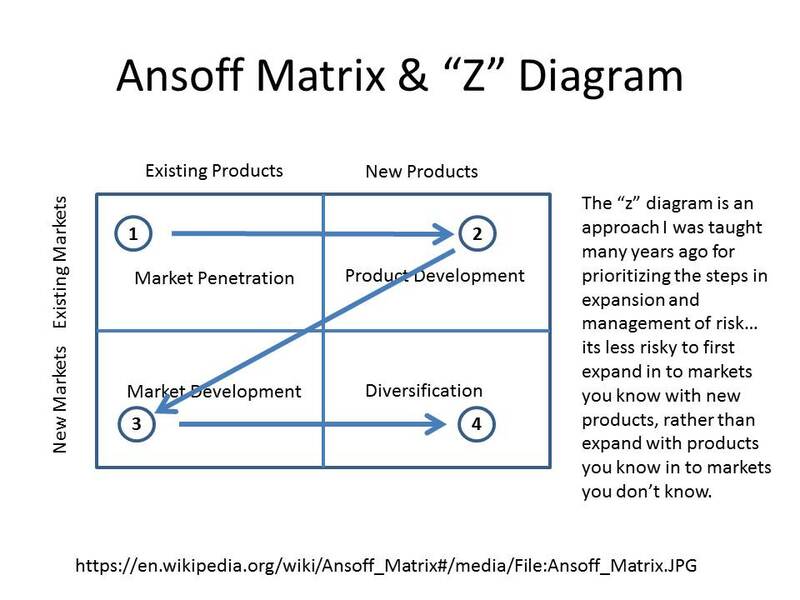 Using Ansoff’s matrix I could visualize a more complete model of the economic development options to be managed in a portfolio of innovation initiatives. Hawaii’s Strategic Development Corporation really made the point clear when they said in their 2014 annual report, “HSDC undertook a new approach to supporting the growth of a vibrant innovation sector in Hawaii…” (emphasis added) and in doing so recognized that entrepreneurship was only a part of the overall strategy. 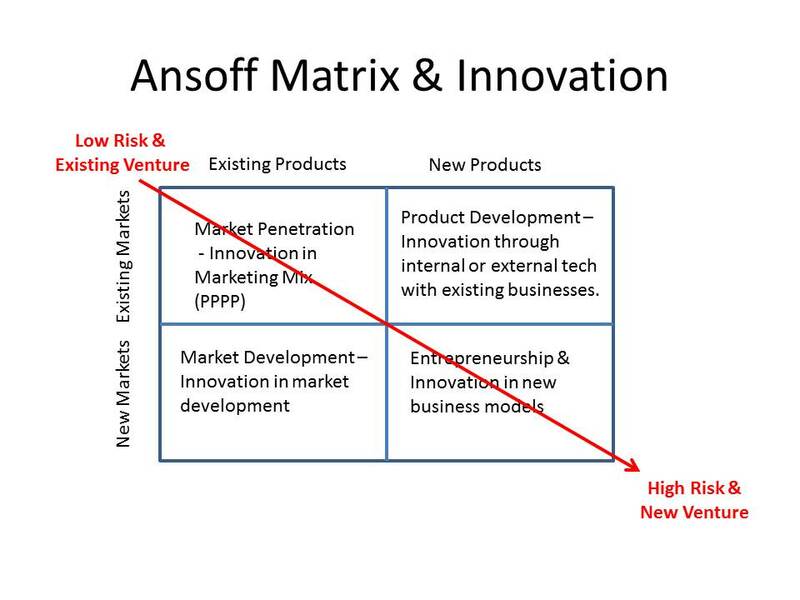 To see the new innovation strategy matrix I should review the original Ansoff Matrix that outlines four broad marketing initiatives. The matrix below identifies four business strategies based on whether the strategy is focused on existing products or new products (or services), and if the target is existing markets or new markets (customers segments). Keep in mind that in this context “marketing” is not just the narrow area of promotions and advertising we often associate with “marketing something”. Marketing in this context is a strategic activity of managing the four “P”s of a comprehensive and integrated approach to decisions related to Price, Product, Place (distribution) and Promotion. Market Penetration: Existing companies that gain market share or the addition of a new business using an existing business model (franchise) into the existing market. This would be typical efforts to help an existing business improve its promotional tactics, assisting someone open a new franchised restaurant, or developing an improved distribution channel strategy. Product Development: Innovation strategies that help existing companies improve their ability to develop new ideas, commercialize ideas (products or services) that have been set aside due to limited resources, and matchmaking of a company that needs a new product or technology to another company or university that has it and does not have the market resources to commercialize the idea. Market Development: Innovation and economic development strategies that focus on the market including bringing an existing company into a region with their existing products or helping existing businesses with the tools to take their products to new markets. Entrepreneurship and innovation in new business models: Here at the far corner is where traditional, risky, entrepreneurship sits with the challenge of typically taking a new idea in to a new market and trying to build a new business structure. The most extreme case are the ones we associate with being “disruptive”, that change the very definition of the products and markets, like an Uber car service. But it doesn’t have to be limited to that, back towards the middle can be opportunities to apply the tools of design thinking and lean entrepreneurship to existing businesses in order to help those business develop new business models that result in new product and market opportunities. The line running diagonally across the matrix, touching each of the strategies above, is a path of increased risk. A long this path is a middle area where more effective use of economic development investments might exist today or need to be strengthened that creates a culture of innovation rather than just entrepreneurship. These investments in the middle would encourage and challenge existing businesses to enter the innovation matrix and use their existing financial strength, management teams and business systems to create new growth. It’s exactly what I found in Michigan where they learned that pure entrepreneurship efforts were too slow, too limited and too risky and even when successful, resulted to often in new companies leaving. I’d like to see Alaska explore what would be required to create a balanced innovation portfolio and explore with some existing businesses what would be needed to support them in a new era of innovation and business growth that will replace some of our oil production economic base. Our current efforts to develop new risk capital and resources for extreme innovation, entrepreneurship, can perhaps be expanded into an area with less risk and larger returns by engaging existing businesses in a broader approach to innovation and entrepreneurship.